Earlier this month, the Northern Rocky Mountain Grotto was recognized with the 2019 Conservation Project Award from the US Forest Service and Bureau of Land Management. 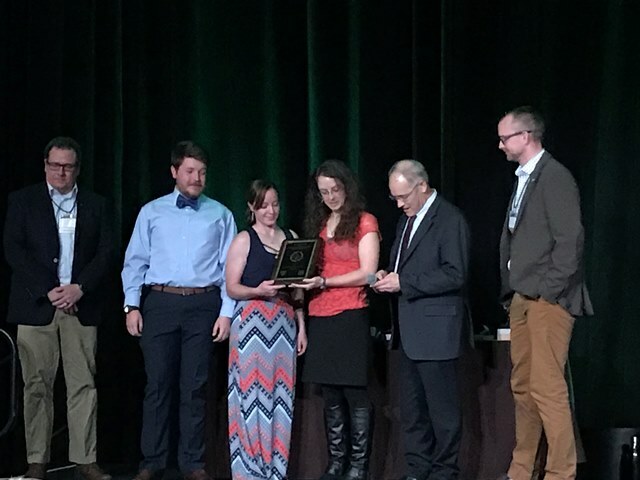 NRMG representatives Ellen Whittle, Savannah Sawyer, and Carl Froslie traveled to the 84th North American Wildlife & Natural Resources Conference in Denver to accept the award on the Grotto’s behalf. The Northern Rocky Mountain Grotto has worked with federal and state agency partners to conduct cave inventory, monitoring, and restoration projects since 2010. Projects include the annual Lick Creek Cave Clean-up, the installation of informational signs and registers at dozens of caves, and a Grotto-wide commitment to report bat observations. The NRMG also works with the Bigfork High School Cave Club to monitor cave climates, visitor impacts, and biological points for caves throughout the northern Rockies. The NRMG was nominated for this award by their USFS/BLM partners in Montana. AGM 2019 Videos are All Online!